Rediscover romance in this exquisite 1843 Greek Revival listed on Vermont's Historic Register. Once part of a prosperous dairy, Maplewood remained in one family for 100 years before becoming a warm, inviting inn in 1986. Experience panoramic country views, spectacular sunsets and intimate atmosphere amid fine antiques. 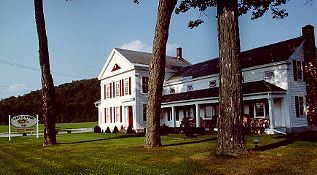 The bed and breakfast is conveniently located in Central Vermont's Lakes Region near Lakes Bomoseen, St, Catherine, Glen and Champlain, Killington and Pico ski areas, historical sites, museums, shops and restaurants. Close to New York destinations such as Lake George and Fort Ticonderoga. First class rooms/suites feature outstanding period decor, private baths, working fireplaces, A/C, CCTV, phone and many other amenities. Several lovely common rooms include a gathering Room/Library and Parlor with complimentary cordials. A victorian breakfast begins your day. Mobil Three-Star, rated Bed and Breakfast, open all year, major credit cards accepted. This and other Fair Haven Bed and Breakfast Inns can be found here in The Register.